This was not an easy theme. "Maverick" didn't speak a lot to me! I decided to forget "maverick" for a while and to think "different" instead. Much easier! Some time ago, I started to teach myself to weave. It's always been a kid's dream for me. And now my new quest has become to somehow incorporate weaving into my art and to do something DIFFERENT from what I've been doing for the last few years. I really don't know yet where this will lead to, but in the meantime, I thought I would simply add a little woven piece to my quilt. My Maverick quilt had to follow my self-imposed Japanese theme and fit in with the first three quilts of the 20x12 series. I thus used a shibori piece of fabric I had dyed when I was working on my "Mythology" quilt. 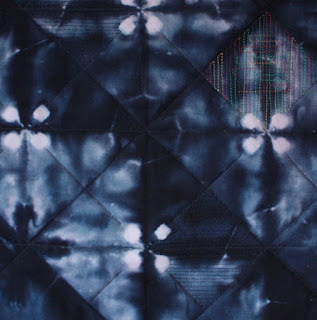 This dyed piece in itself is a bit of a Maverick as it came out really different from my other shibori pieces, with very definite marks, strong contrast and lots of personality. The small weawing was done with a paper yarn purchased in Kyoto last spring. At first, I only attached it to the quilt with some hand stitches, but it kept moving as it is rather loosely woven. Thus, I added some machine stitching using the same variegated thread as for the quilting of the solid blue part of the quilt. 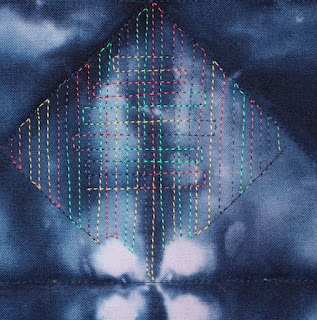 Two other squares are quilted in dark blue. I might quilt the rest of the shibori piece in the same way (i.e. blue), but I'm not sure yet it really needs it. 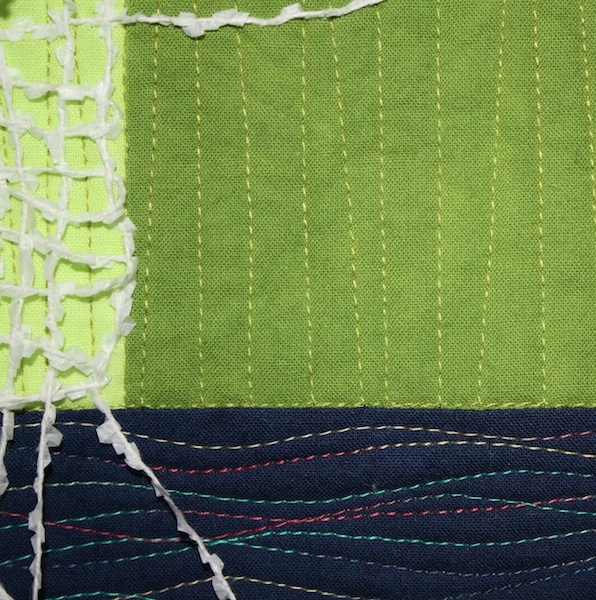 The title means "Shibori and weaving". Thank you to my dear Japanese friend for suggesting it. 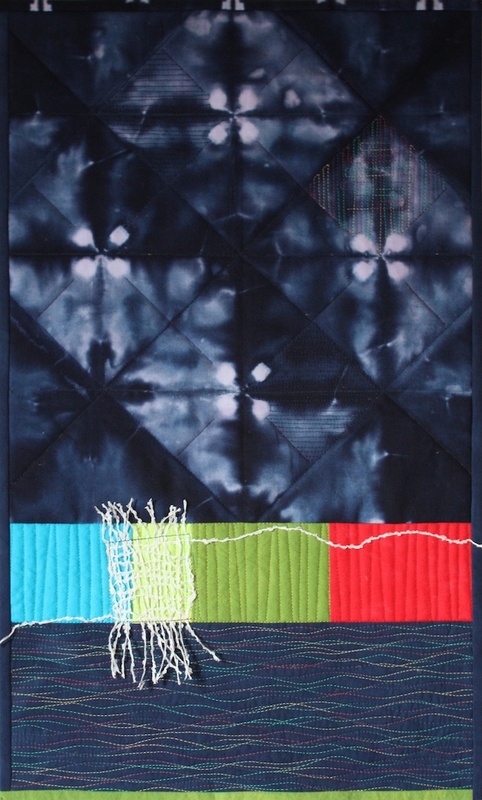 Don't forget to visit the Twelve by Twelve blog to see the other Maverick quilts. I like the way you incorporated "different" into this piece and still kept the Japanese theme. The colorful quilted line and the weaving have a nice effect on the deep blue. I also really like the square you did with the variegated threads! 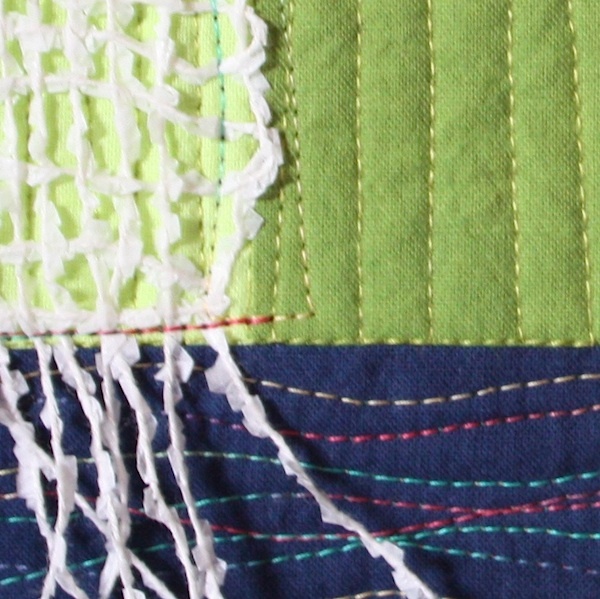 I love how you are incorporating weaving into your quilt! I've wanted to do the same thing lately, go in a different direction with my weaving. Thanks for the inspiration and best wishes on your weaving! C'est magnifique Françoise, le mouvement et la texture, les couleurs... Vous me donnez envie de travailler avec le tissu! Well done Francoise - look forward to seeing more weaving too! Thanks for your comment on my work. 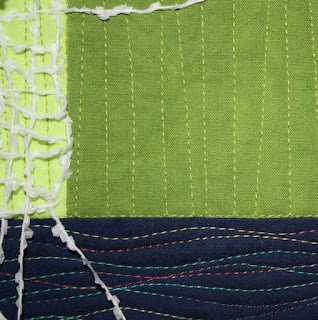 I love it Francoise, and it's a really good interpretation of the theme, the loose threads from your weaving feel maverick against the formality of the design as does your one square of coloured stitching. Superb!